On Saturday, June 24, 2006 the Board of Trustees of The Association for Gravestone Studies presented The Oakley Certificate of Merit to the Olde Historical Burial Ground Joint Committee of the First Presbyterian Church for distinguished achievement in promoting the mission of the Association. Mr. John O'Brien of Belvidere, a member of the Association, nominated the Olde Presbyterian Burial Ground, located on Main Street in Hackettstown, for this award. The award was accepted by Mr. and Mrs. Gerard Geiger, members of the committee on behalf of the Joint Committee. 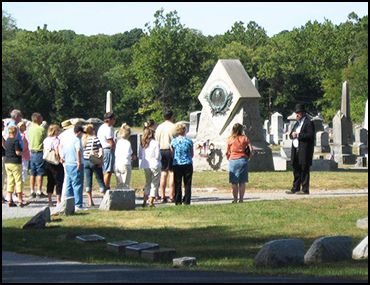 During this year's Victorian Days Celebration, Mr. John O'Brien, dressed as an Undertaker, will conduct two guided walks through the Belvidere Cemetery. The cemetery was founded in 1834 and has many notable interments, including Major League Baseball catcher Charlie Berry; U.S. Representative from New Jersey's 4th congressional district Henry S. Harris; U.S. Representative from New Jersey at-large John Patterson Bryan Maxwell; Secretary of the Navy during the Ulysses S. Grant presidency George M. Robeson; General William Maxwell; and many graves of people who fought in the American Revolutionary War. Mr. O'Brien's guided cemetery tours enable you to experience the Victorian Era in an entirely new, and unique way. Stroll through the beautifully landscaped Belvidere Cemetery while learning about Victorian Era burial customs and viewing antique monuments, many of which date back to the Civil War. Although online ticket sales for these tours have ended, there are still tickets available. Please visit our TICKET TENT during Victorian Days to purchase a Cemetery Tour Ticket for $20 per person.